More young nurses are opting to obtain advanced degrees, which could help fill gaps in primary care. But it could also take them away from the patient's bedside. Nearly half of millennial nurses (ages 19-36), 35% of those in Generation X (ages 37-53), and 12% of baby boomers (ages 54-71) plan to become advanced-practice nurses, according to AMN Healthcare, a healthcare staffing agency that polled nearly 3,400 nurses in April 2017. They are predominantly aiming to become nurse practitioners, who generally have more autonomy and are well-suited to take on less acute cases and fill care gaps left by the shortage of primary-care physicians. 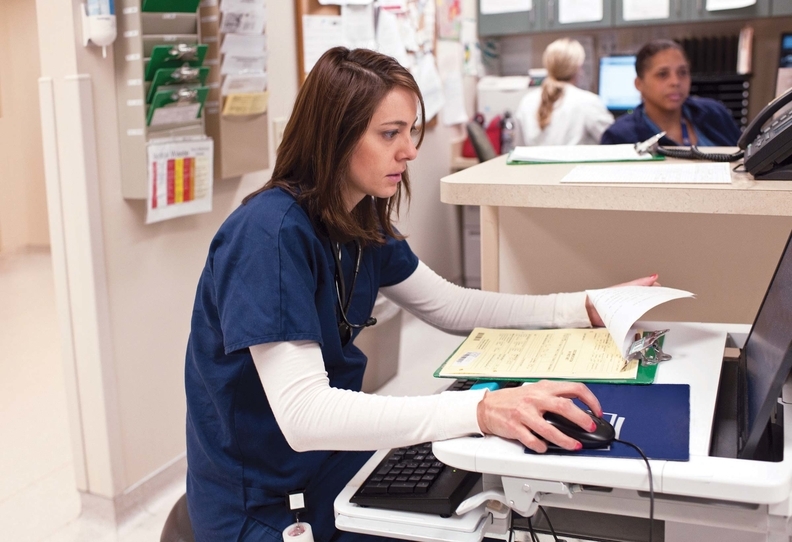 But there is also a lack of registered nurses, and this education trend could exacerbate the current shortage, said Marcia Faller, chief clinical officer for AMN. "The most pressing need in healthcare is for the registered nurse role," she said. "The supply is just not there." Seven states are projected to have RN shortages persist through 2030 as the aging population and need for chronic disease management will drive demand, according to the U.S. Bureau of Labor Statistics. Nurse practitioner is one of the fastest-growing occupations in the United States, in part because it offers independence, a challenging work environment and educational progress. More than 1 in 4 millennial nurses said they would pursue a nurse practitioner's degree in the next three years, compared to 19% of Gen Xers and 4% of boomers, according to the survey. Another 14% of millennial nurses said they would pursue education to become clinical nurse specialists and 7% said they would become certified registered nurse anesthetists. More generally, 39% of millennial registered nurses said they plan to pursue a master's degree in the next three years, while another 11% said they will seek a doctorate, both of which were significantly higher than Gen Xers and boomers. But when organizations help nurses earn those higher degrees, they often leave for higher-paying jobs. "Lots of nurse turnover makes patients uneasy," said Jennifer Bullard, co-CEO of Interim HealthCare's Texas and New Mexico division, a home health provider. "There's a ripple effect." High turnover has altered business models. Interim HealthCare, for instance, has focused its business in smaller communities where there is less turnover, Bullard said. Seventeen percent of millennial RNs plan to look for a new nursing job while the economy is improving, compared to 15% of Gen Xers and 10% of baby boomers, according to the AMN survey. Ten percent of millennials said they would pursue travel nursing, while only 6% of Gen Xers and 5% of boomers concurred. More than a third of millennials seek a leadership role, compared to 27% of Gen Xers and 10% of boomers. Nursing leaders need to cultivate a workplace with a positive culture, Faller said. When asked whether quality of patient care is positively influenced by culture, 68% of millennials responded affirmatively compared to 62% of Gen Xers and 57% of boomers. More millennials also correlate more transparent quality initiatives with better patient care. Generally, millennials show more support for their leadership and value one who supports career development, according to the survey. "More organizations need to ensure that RNs are working at the top of their license," Faller said. This often requires more staff, which doesn't gel with competing cost-containment concerns. Interim HealthCare has been giving younger nurses more schedule flexibility, part-time options for mothers and leadership opportunities for nurses seeking higher degrees. It has also eased experience requirements and boosted training protocols to help nurses learn on the job. Similar to other providers, Interim is also more involved with nursing schools. Millennials are generally more focused on work-life balance rather than pay, Bullard said. "We have had to think outside of the box for different generations," she said.